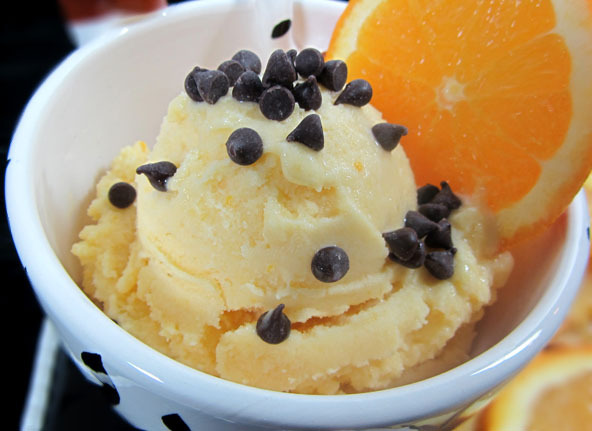 An orange creamsicle made into ice cream? Wow, and a healthy yummy version you say? Bring it on! The coconut milk is what makes this ice cream so creamy and delicious. If you know you like canned coconut milk then you can use that but be aware that not everyone likes it canned. The taste of canned is very different from when it is freshly made or frozen. You don’t want to buy the “lite” version either. You can make your own fresh coconut milk. For convenience and price I buy frozen coconut milk in the freezer section at my local Asian Supermarket and I keep it on had for many other recipes. I’m telling you fresh or frozen coconut milk in this recipe really resembles the taste and texture of traditional western ice creams. Substituting any other milk in this recipe will not be nearly the same. Luckily enough, coconut milk is a healthy, acceptable choice for all six types of Wholetarians. Juice approximately 6 to 7 oranges to make 2 cups of fresh juice. Blend all the ingredients together (except for the stevia) in a high powered blender. Taste and adjust for desired sweetness using the stevia if needed. Pour mixture and into the freezer bowl and immediately turn the machine on and let it mix until it freezes, about 20 to 25 minutes. Ice cream will have a soft, texture. Tropics frozen coconut milk comes in a 16 oz bag so you could either make a second batch or use the extra coconut milk in your next smoothie. Canned coconut milk contains 1½ cups. Remember removing the fiber from fruit by juicing is hard on the liver and unhealthy due to its high amount of fructose. Fiber is the antidote to fructose so make sure you add the whole orange and banana to restore some of the lost fiber. The healthy fat from the coconut milk also helps reduce the GI (glycimic index) from the orange juice and the maple syrup and honey.